The National Learn To Play Day is the ideal way to start, or get back into, playing a musical instrument, whatever you would like to play. The UK musical instrument industry charity, Music For All, has once again been working hard with its partners: The Musicians' Union, the Take it away scheme, Rockschool and Musicradar.com, instrument manufacturers, music shops and venues to create and deliver a day that inspires everyone, young and old, to join in an amazing musical learning experience and opportunity. Jools Holland, Patron for the charity, commented, "Whether you used to play or whether you have always wanted to play... this is the day for you. I am delighted to help Music for All in their quest to inspire more people to participate in music making, either for the first time or to return to playing after having lapsed. I hope that my involvement will help the charity reach more people and get more people "having a go". Whatever musical instrument you've wanted to play, the National Learn To Play Day is the perfect opportunity to get a free lesson in one of the many venues all over the UK. There will be over 10,000 free lessons delivered by fully qualified music teachers on a range of instruments including guitar, bass, drums, keyboards, violin, piano, trumpet, oboe, percussion and many others including DJ mixing and singing. The aim is to ensure everyone taking part will have the opportunity to play something before they leave and afterwards, there will be promotions to get money off buying equipment and special offers on further music lessons. There will be a host of fun events around the day with many celebrities taking part. Previous years have seen the cast of hit west end show 'Once', Al Murray, Harry Hill, Pink Floyd's Nick Mason all giving free music lessons as well as bands such as Lawson and Lower Than Atlantis visiting and showing members of the public how to play. To add to the carnival atmosphere, venues have put on Caribbean steel bands, buskers and invited local celebrities to take part. 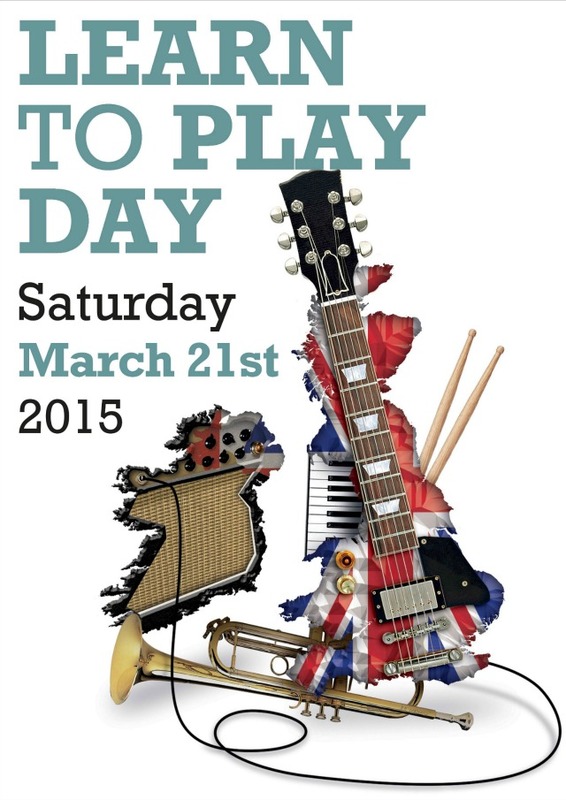 Remember... Saturday 21st March 2015 is National Learn To Play Day – make it a date!